Resource offers access to more than 600 grants and awards. Getting teachers and parents excited about the transformative power of technology is easy. Finding the money to invest in — and sustain — the next great classroom innovation is not. States, many of which are still reeling from the effects of a historic recession, have been forced into hard funding choices. And schools are feeling the pain. The National Governors Association and the National Association of State Budget Officers released a report late last year that said 18 states made impromptu, mid-year cuts to their fiscal year education budgets in 2011, totaling more than $1.8 billion. The same report, which I first encountered on Education Week’s issue page on school finance, said schools were on pace to spend $2.5 billion less on education in F.Y. 2012. That’s a lot of money. But the cuts hardly come as a surprise. The nation’s K–12 schools seem to be forever scrounging for funds, especially when it comes to technology. Here’s the rub: Experts say the predicament is likely to get worse before it gets better. But that doesn’t mean schools are out of options, either. 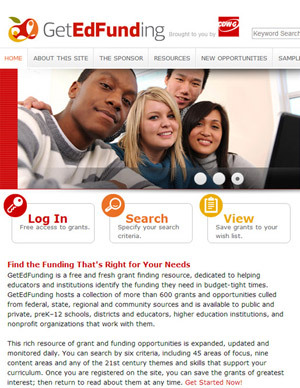 If you’re looking for funds to get your next big classroom technology project off the ground, or just to continue the good work you’re already doing, check out www.getedfunding.com. Sponsored by CDW•G (the same folks who underwrite the site you’re on now), the resource features free access to more than 600 grants and awards educators can pursue to fund new education and technology programs at their schools. It’s not the only grant database out there, to be sure — the National Education Association has a great database, as does Grants.gov, the federal government site — but it might be among the easiest to use. Rather than feature any and every award participating researchers and education advocates can get their hands on, the site aims to simplify the process by including only those grants that accept letters of inquiry and unsolicited applications. As they search, educators can save relevant grants to a “wish list” that they can go back to and consult later when deciding what awards to apply for. Each listing provides a description of the grant and its deadline for application as well as information about how to apply.